Tour Our Facility - Independent Components Corp.
We have modernized our distribution facility over the last 3 years. All inventory has been located in new bins. Each bin has a unique warehouse location with overstock. All areas of the warehouse now have secondary locations for backup and bulk inventory. A belt driven conveyor was installed between the first and second floor for more efficient order processing. An automatic conveyor was installed to move finished goods from the machine shop the receiving area of the warehouse. New lights were installed throughout the warehouse. New kit assembly tables. New valve assembly work stations. New receiving area built. Storage facility for gasket steel rule dies built. It efficiently holds over 2000 tools in an area only 145 square feet. Area built for holding sample gaskets. Gasket material storage cart that holds over 5000 pounds of various gasket material. Cat walk built in warehouse rack system for more efficient storage and retrieval of large filters. 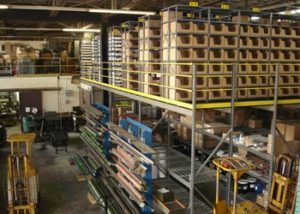 New mezzanine build on rack system that added 1600 square feet for additional parts storage. New storage system for castings. We store over 6 tons of raw castings in an area only 160 square feet of floor space. We are committed to manufacturing high quality compressor parts, built to consistent specifications, delivered when you need them, at a fair price. Quality is the responsibility of every employee at Independent Components Corp. Our quality control procedures begin with our library of prints using AutoCad Software. All equipment is on a regular maintenance schedule to keep equipment accurate for holding tight tolerances. We have an extensive inventory of gauges and measuring devices to calibrate equipment and inspect finished products. Our modern machine shop manufactures about 20% of the products we sell. 3 Mazak CNC Quickturn Lathes with live tools, sub-spindals and automatic bar feeds. We manufacture gaskets with our 80 ton Schwabe folding head press and 22 ton Atom traveling head press. Our inventory of steel rule dies number over 2000. We also manufacture custom gaskets to your drawing or specification. We are able to make custom gaskets usually in one day. Many of our customers request gaskets in special materials and thickness to meet special needs. Grafoil® is a Registered Trademark of UCAR Carbon Company.